Anton Yelchin may be “cynical” about fame, but following the acclaim of his latest movie, Like Crazy, the Russian-born 22-year-old actor may just have to get used to it. He talks to Steve Cummins about improvisation, paranoia and his parents, Olympic athletes, who were forced to flee Russia upon his birth. Anton Yelchin looks like he’s ready to kill me. Lips pursed, his green eyes narrowing, he scowls when I suggest that signing-up to star in Like Crazy — a low-budget, largely improvised, indie movie— was, on paper, a risky move. Fixing his eyes on mine, there’s an intense stare as he seems to try and suss me out. And then it’s gone. It’s a telling moment. Later, as we sit back in the sunshine during an abnormally warm day in Dublin, the 22-year-old actor will tell me of his cynicism; that he doesn’t trust people; that his core characteristic is paranoia; and that guilt is “a profound part of my personality”. Such open self-analysis is at odds with other Hollywood stars of his ilk, but then there’s something different about the Russian-born actor. Dressed in a green Harris Tweed sports jacket over a checked shirt and navy jeans, he’s animated, candid and talkative, where others are guarded, when faced with questions on his personal life. Talk to him about his work methods — his obsessive note-taking and his ability to bring extraordinary depth to characters such as Jacob in Like Crazy and Porter in Jodie Foster’s The Beaver — and he becomes even more engaged, words whizzing from his mouth and hands moving around impatiently as he struggles to contain himself. Of interest to him or not, it is something he’ll increasingly have to deal with. Like Crazy, his 23rd movie, is about to make him one of the hottest actors on the planet. A no-budget film, the Drake Doremus-directed romance of two young lovers, whose relationship is tested by long-distance separation, was the standout hit of last year’s Sundance film festival. Winning the festival’s Grand Jury Prize, audiences wept, critics raved and Paramount paid out a reported $4million for the distribution rights. 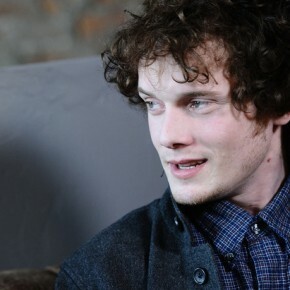 Born on March 11, 1989, in Leningrad, Soviet Union, Yelchin moved to LA when he was just six months old. His parents, Irina Korina and Viktor Yelchin, were stars of the Leningrad Ice Ballet. They qualified for the 1972 Winter Olympics in figure-skating pairs but were barred from participating by the Soviet government because of their Jewish faith. Wealthy by Soviet Union standards, they gave up everything to come to America. “I have tremendous respect and admiration for my parents beyond anyone that I’ve met or will ever meet, simply because they’re beautiful, strong people,” Yelchin says as his eyes dart around the room. “The amount of suffering that they went through in the Soviet Union and in the kind of moral, emotional, intellectual pressure and fear of coming to a place where you don’t speak a word of the language but you just know you need to do it. “And a lot of the reason they did it is for themselves, but also, for me, y’know, because they had a little kid and they didn’t want me growing up there — or a baby — and they didn’t want me growing up there. And, eh, I can’t even begin to imagine what that feeling is, that fear. I almost think it’s like standing in front of an abyss and you’re just like “okay I’m going to leap in”. Especially my Dad, especially when he was a kid, he was I mean, beyond poor, I mean Soviet Union poor. His parents’ experience has had a profound impact on the young actor. There’s a sense though that he bares an unwanted weight of his ancestry. If he could, you feel, he’d love to shake the tag brought on by his “very Russian-sounding name”. He confesses to having trust issues, an experience that no doubt helped him mould the character of Jacob as he delved into “closeted jealousy, y’know, and suspicion that you don’t want to put out in the open because it’s bad”. Like Crazy is out now.